I hope everyone had a wonderful festive Christmas and New Year!!! It is hard to believe another year has passed already. My children and I took 2 weeks off for the holiday and resumed back to light school on the December 28th but we return to our regular schooling Jan 3rd. We have several field trips planned already for the month of January. Early this month we are heading out to a 12th night celebration in a Viking long house with my husband's Regia re-enactment group. I must say the whole family is looking forward to it. There is also a planned week stay down town London while my husband is at a work conference. It is my daughter's birthday while we are there so we have tickets to a London show. Lots planned. 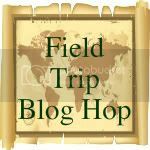 While officially none of these field trips are school related, we will be learning tons and seeing lots of great things. 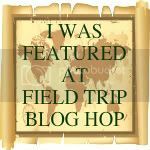 Lastly, Katie from Brighton's Park passed on a blog award to the Home School Field Trip hop! Thank you Katie for your wonderful support of the Home school Field trip Hop! !